Our Hemsworth cocktail ottoman is sure to catch your eye. 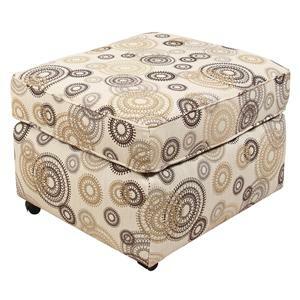 The transitionally styled tailored ottoman is accented with button tufting, a nail head trim, and an turned wood leg. Go ahead... Kick your feet up and relax! The Hemsworth Accent Ottoman by England at Virginia Furniture Market in the Rocky Mount, Roanoke, Lynchburg, Christiansburg, Blacksburg, Virginia area. Product availability may vary. Contact us for the most current availability on this product. Leg or Skirt Legs are 4'' x 4'' pyramid screw-in with medium brown finish.